“Keep that door shut! I’m not heating the outside!” I can’t tell you how many times my two brothers and I heard those words from our mother as we were growing up during cold Ontario winters. We needed constant reminding because kids don’t really get it until they become adults paying the bills that go along with home ownership. Electricity is one of the major expenses of having a house. It keeps us warm in the winter and cool in the summer, cooks our meals and washes our clothes. On top of those major accomplishments, most households have a myriad of smaller electronics, computers and personal care products that we plug in every day or leave plugged in constantly. Turn the thermostat down one or two degrees when you’re sleeping or when no one is at home. A programmable thermostat is a great help. Change the furnace filter regularly, usually once every three months. Close vents and doors to rooms that are not in use. Seal doors and windows with weather stripping and fill any cracks with caulking. Make sure furniture and rugs aren’t blocking vents. Replace outdated furnace and air conditioning units with high-efficiency models. We were told that our thirty-year-old furnace was sending fully half of our heating dollars straight up the chimney. Yikes! Another issue parents nag about is turning off the lights in a room when you leave it. Mom and Dad are right. Why burn electricity nobody is using? Using dimmer switches and timers inside and motion detector lights on the outside can help to reduce electrical expenses as well. Fluorescent lights use less energy than incandescent bulbs and compact fluorescent bulbs are also a good way to reduce the use of electricity for your lights because they last ten times longer than a regular light bulb. The issue many of us are having with compact fluorescent bulbs is that, if accidentally broken, they can be hazardous to your health due to mercury content and must be disposed of with extreme care. Health Canada has more information about compact fluorescent bulbs, what to do if you break one and their safe disposal when they burn out. Even appliances that are not turned on or in use are a drain on electricity. This drain is called phantom or vampire power and it draws electricity into your home from the grid even when you don’t need it. 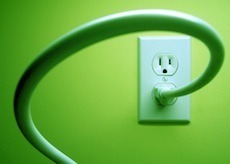 Phantom power accounts for ten per cent of your home’s electricity use every year. By cutting out these unnecessary drains, you could gain a month or more of free electricity every year. To prevent phantom power from adding to your hydro bill, plug the TV, DVD player and other entertainment devices into a power bar with an on/off switch so you can turn everything off at once when no one is using them. This method would also work in the home office for your computer, printer and monitor. Unplug the electric coffee maker, toaster or kettle when you’re finished using them to prevent them from adding to your electrical costs. And once your cell phone has finished charging and the power drill or hair dryer are no longer in use, unplug the cords from the wall socket. You’ll use less power by doing one large load of laundry, rather than several small ones throughout the week. You probably won’t be able to do this if you have a baby or small children, but making sure you have a full load of laundry before you turn on the washing machine will help to save money. The same goes for the dishwasher. Make sure it’s full before you run it. If you’re in the market to retrofit your home with new windows and doors, a new furnace or air conditioner or a new major appliance, look for the Energy Star label to make sure you’re getting the best energy efficiency you can. According to the Ministry of Natural Resources, energy retrofits along with using energy conservation tips in your home can save an average of 20 percent off your current electricity usage. As you can see, there are a lot of little things you can do every day that will add up to big savings on your monthly electricity bill. Do not “Close vents” as it puts strain on the fan/compressor, etc. The system is designed to move so much air and when you restrict the outflow, it makes them work harder and wear out faster. Please lean from my $8,000 mistake. See if your local energy companies to home energy audits. You can get a lot of personalized tips this way! I agree, back home we always make all appliances are turned off and plugs are off when we’re not using them. We even sleep at night with all the lights off just to save huge on the electricity bills and trust me, we really save a lot. One way I really saved money last year on heating my house was with a Greenway furnace fuel saver. The heat bill went down almost 50% from the previous winter. I never paid more than $100/mo. Granted it was a little bit milder last winter but the fuel savings was very significant. I also bought their fuel savers for my Ford Explorer and my MPG went from 13.6 avg to 16.2 avg. It’s amazing how doing the small things will add up. Last month I turned my air off during the day, made sure no extra lights were on, and turned off small appliances those small things literally cut my electricity bill from $120 to $65. The old saying waste not want not is truly applicable in the current age. Far too many people take the little things for granted. I agree making sure everything is turned off at the plugs will make a massive difference to your monthly energy expenditure.